Obituary – Eyler, Marjory Julian (Craig) « Perry High School Alumni Association, Inc.
Funeral will be at 10:30 a.m. Saturday at the Strode Funeral chapel at Stillwater for Marjory J. Eyler, 71, Stillwater, a former Noble county resident and teacher, who died Wednesday at Stillwater Municipal hospital. Dr. William R. Henry will officiate and burial will be at the Fairlawn cemetery at Stillwater. Memorials may be made to the Southern Heights United Methodist church at Stillwater. Mrs. Eyler was born July 17, 1907, in Noble county, the daughter of Wm. Penn and Emma L. (Hicks) Craig. She attended Perry schools through her junior year in high school, when her family moved to Stillwater. She was a graduate of Stillwater high school and attended Oklahoma State university. 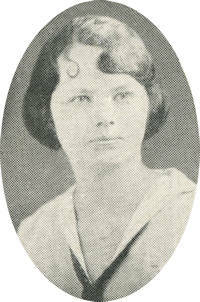 She taught school in Noble county before her marriage, May 4, 1930, in Stillwater to William Cleveland Eyler. She was a member of the Southern Heights United Methodist church, Missionary society, the United Methodist Women, and, along with her husband, helped to organize the Fellowship class at the First United Methodist church in 1931. She was a past noble grand of the Olive Branch Rebekah lodge, was a member of the Degree of Shivalry lodge, a branch of the Rebekah organization, and was a member of the Ponca City Ladies Auxiliary Patriarch Militant and served two years as state secretary of that group. She is survived by one brother, Homer Craig, Farmington, N. M.; and two sisters, Mrs. Mark (Bessie) Whelan, Albuquerque, N, M,; and Mrs. Elmo (Helen) Ricker, Stillwater. She was preceded in death by her husband in 1963, her parents, one brother and three sisters.